The young, second-generation Japanese immigrants (Nisei) relocated to the Topaz Mountain Internment Camp during World War II faced a unique challenge. Born in American to the children of Japanese immigrants, they were forced to negotiate between being legal citizens and being seen as outsiders. After Pearl Harbor in 1942, President Roosevelt signed Executive Order 9066 creating the Military Exclusion Zones along the Pacific Coast. The order pushed 120,000 Japanese out of their homes and into internment camps, including Topaz. The intention was to protect America against any immigrants whose allegiance was still with Japan. The youth were directly confronted with the issue in the form of the Loyalty Exam. Two of the questions read, “Are you willing to serve in the armed forces of the United States on combat duty, wherever ordered?” and, “Will you swear unqualified allegiance to the United States of America . . . and foreswear any form of allegiance to the Japanese emperor, to any other foreign government, power, or organization?” These questions were the basis of the “Yes-Yes” and “No-No” groups that caused division among their age group and all within the camp. Despite their circumstances, Japanese-American youth held on to the hope of an America that offered opportunity. They created from scratch, along with teachers and administrators, a successful school with limited resources. In fact, many of the students complained in interviews later in life about the lack of credible teachers and resources. 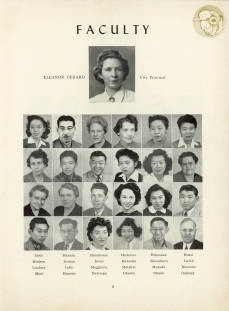 The draw to a world they had grown up in, like Yoshiko Uchida who continually applied to go to college while in Topaz, highlighted the difficult situation these Japanese Americans were in. They believed in a nation who could give them everything, but were left to wonder why they were building their own prison walls when they were more than willing to fight for the nation that they were both “born” to and “belonged” in. 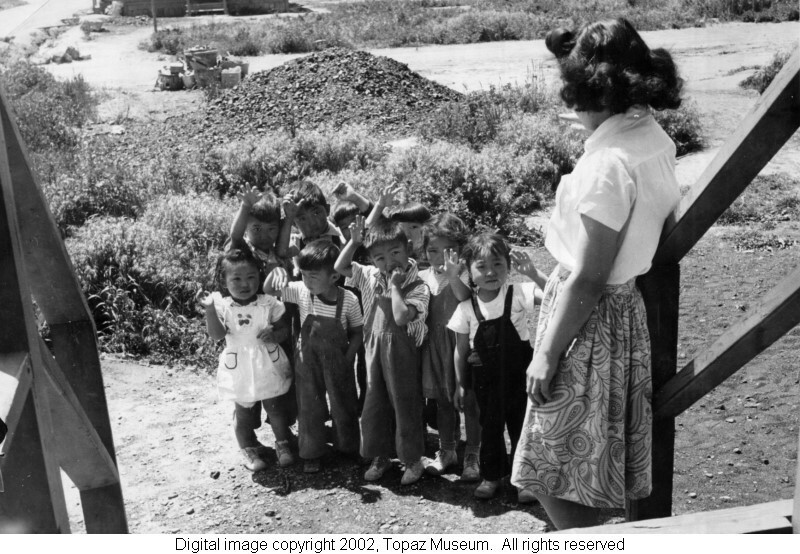 WRA Pre-school: A preschool class run by the War Relocation Authority (WRA). ~ Source: Topaz Museum. J. Willard Marriott Library. "WRA Pre-school," available at https://collections.lib.utah.edu/details?id=341292. 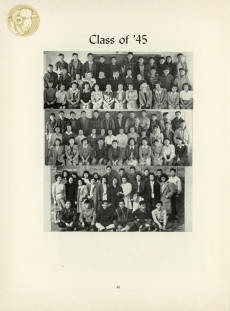 Topaz Class of 1945: Image of the students in the 1945 graduating class. ~ Source: Utah State University Digital History Collection. "Ramblings 1944," available at http://digital.lib.usu.edu/cdm/compoundobject/collection/Topaz/id/4976/rec/2. Faculty of the Topaz School: This is a list of the faculty of the Topaz school. These individuals taught the High School. ~ Source: Utah State University Digital History Collections. "Ramblings 1944," available at http://digital.lib.usu.edu/cdm/compoundobject/collection/Topaz/id/4976/rec/2. 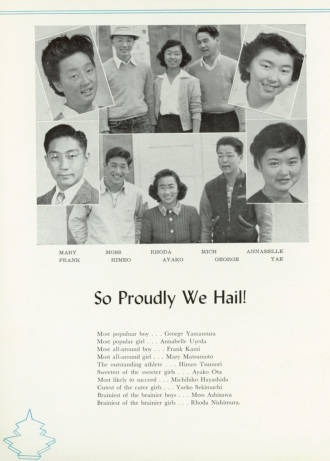 Yearbook Most Likely Section: This is a page from the 1944 yearbook showing the results of the traditional "Most Likely" vote in a graduating class. ~ Source: Utah State University Digital History Collection. "Rambling 1944," available at http://digital.lib.usu.edu/cdm/compoundobject/collection/Topaz/id/4976/rec/2. 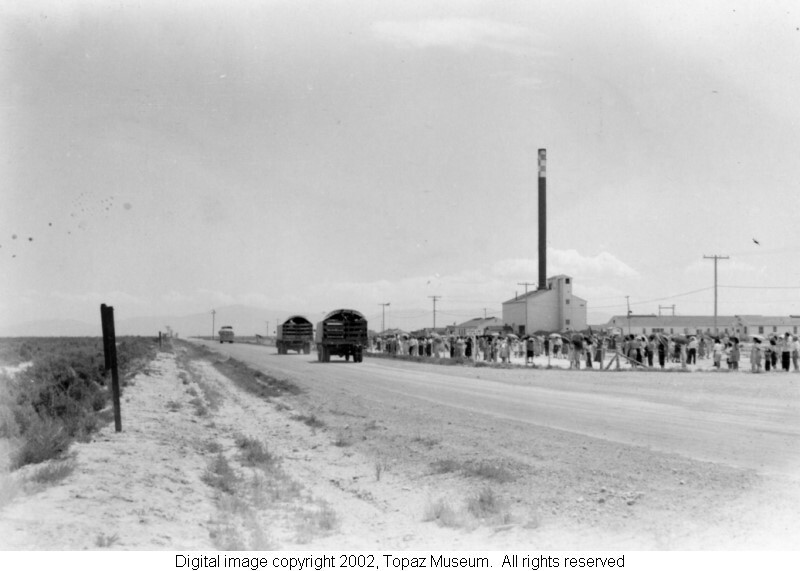 Topaz Internment Camp: Photo of the Central Utah Relocation Center (otherwise known as Topaz Internment Camp), located in Millard County, Utah from 1942 to 1945. 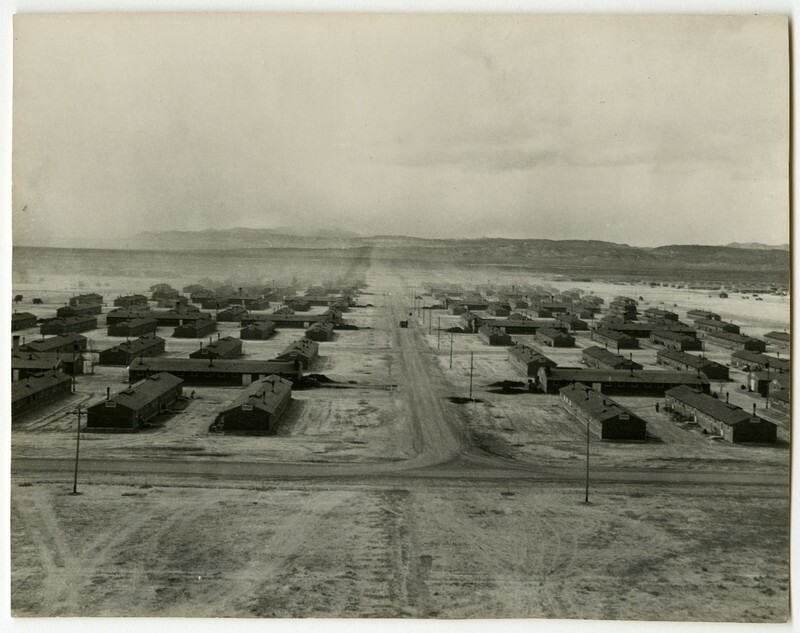 ~ Source: J. Willard Marriott Library, "Topaz Internment Camp," available at https://collections.lib.utah.edu/details?id=993845. Relocation (Topaz Main Gate): People could leave camp and relocate to other areas of the country provided they went through the necessary paper work. This is the main gate at Topaz with the heating plant for the hospital on the right. ~ Source: J. Willard Marriott Library. 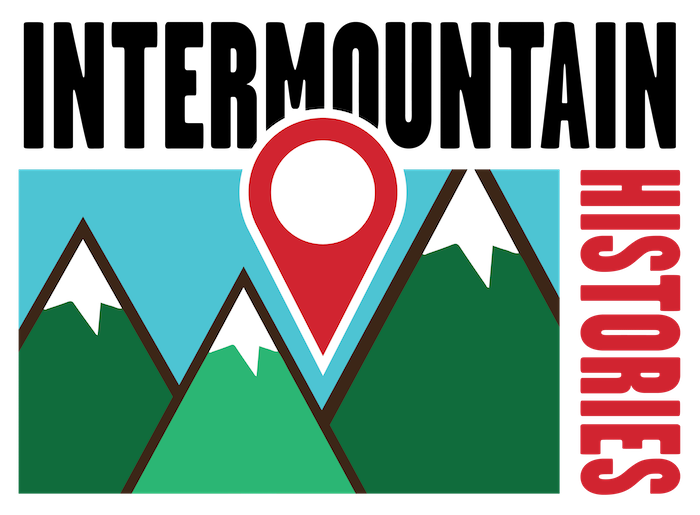 "Relocation," available at https://collections.lib.utah.edu/details?id=341307. Chad Weight and Alex Hauber, Brigham Young University, “Japanese Youth at Topaz,” Intermountain Histories, accessed April 20, 2019, https://www.intermountainhistories.org/items/show/167. Arrington, Leonard J. “Price of Prejudice.” Presented at the Twenty-Fifth Faculty Honor Lecture, The Faculty Association Utah State University, Logan, 1962. The Associated Students of Topaz High School. Ramblings 1944. Digitized by: Utah State University Merrill Cazier Library, 2005, digital.lib.usu.edu/cdm/compoundobject/collection/Topaz/id/4976/rec/2. Accessed 13 Dec. 2017. Hamamoto, Darrell Y, eds., Blossoms in the Desert. South San Francisco, CA: Giant Horse Printing, 2003. Inada, Lawson Fusao, eds., Only What We Could Carry. Berkeley, CA: Heyday Books, 2000. Mori, Toshio. The Chauvinist and Other Stories. Los Angeles, CA: University of California Asian American Studies Center, 1979. Okubo, Mine. Citizen 13660. Seattle, WA: University of Washington Press, 1983. Sasaki, R. A. The Loom and Other Stories. St. Paul, MN: Graywolf Press, 1991. Taylor, Sandra C. Jewel of the Desert. Berkeley, CA: University of California Press, 1993. Topaz Museum. “History.” Topaz Museum. Accessed: November 27, 2017. http://www.topazmuseum.org/history. Uchida, Yoshiko. The Desert Exile. Seattle, WA: University of Washington Press, 1982.